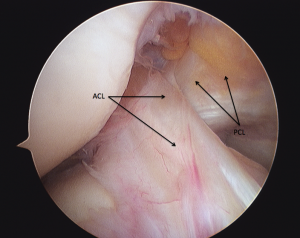 The anterior cruciate ligament (ACL) is one of the main restraining ligaments of the knee. It runs through the centre of the knee from the back of the femur (thigh bone) to the front of the tibia (shin bone). The main role of the ACL is in controlling stability of the knee during rotational movements such as twisting, turning or side-stepping. A popping sensation (or even a popping noise!) is often experienced at the time of injury and the entire knee tends to swell within a few hours or even a few minutes as the ruptured ligament bleeds inside the knee. The knee can become markedly swollen and painful and it is usually impossible to continue with game the injury occurred in. Each time the knee gives way, it can cause pain and swelling that interferes with activities. It will also result cumulative damage to the articular cartilage (the cartilage covering the ends of the femur and tibia) and can cause tears of the meniscal cartilages. A ruptured or torn ACL can normally be diagnosed from the history, including the mechanism of injury and ongoing symptoms and also from specific tests on clinical examination. In some cases, particularly when the knee is very painful and swollen preventing a full examination the diagnosis might be unclear. In these cases it can usually be confirmed with an MRI Scan. If your knee is unstable from an ACL injury, the choice is to alter lifestyle activities to avoid the stresses or activities which cause your knee to give way or to undergo Anterior Cruciate Ligament (ACL) reconstruction surgery.